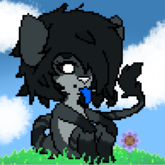 furry Anthro/Feral furry looking for an RP family! Anthro/Feral Furry lookin for an RP family, As the title states! My SL days are growing increasingly boring, With not much for me to do other then to buy and create mods, So I'm looking for a family to take me in as either a Feral dog/horse or an Anthro furry, Preferably both really! Please feel free to contact me in SL with my name > . NYX . (Nixeii) or just reply here! Open to everyone and anyone, Even humans/Mystical character families. ♥ Anthro shapeshifter Doberman Feral dog Shire Horse.